9 impressive make-ahead Mother’s Day brunch recipes so Mom won’t have to lift a finger. You know why we’re talking about make-ahead brunch recipes for Mother’s Day, right? Because we’ve been there. You’re feeling pretty good about your Mother’s Day plans, since you’ve got a gift, pretty flowers (or some other good alternative) and a great card in hand. Then…you realize you haven’t thought about what you’re going to eat on Mom’s special morning, and you’re trying to convince yourself that pizza and coffee would make a decent meal. Don’t worry – we got you. Here are some truly impressive, delectable make-ahead brunch recipes that the whole family can help prepare. Some are easier than others, but they’ll all make for one impressive Mother’s Day brunch. Now, put away that takeout menu. 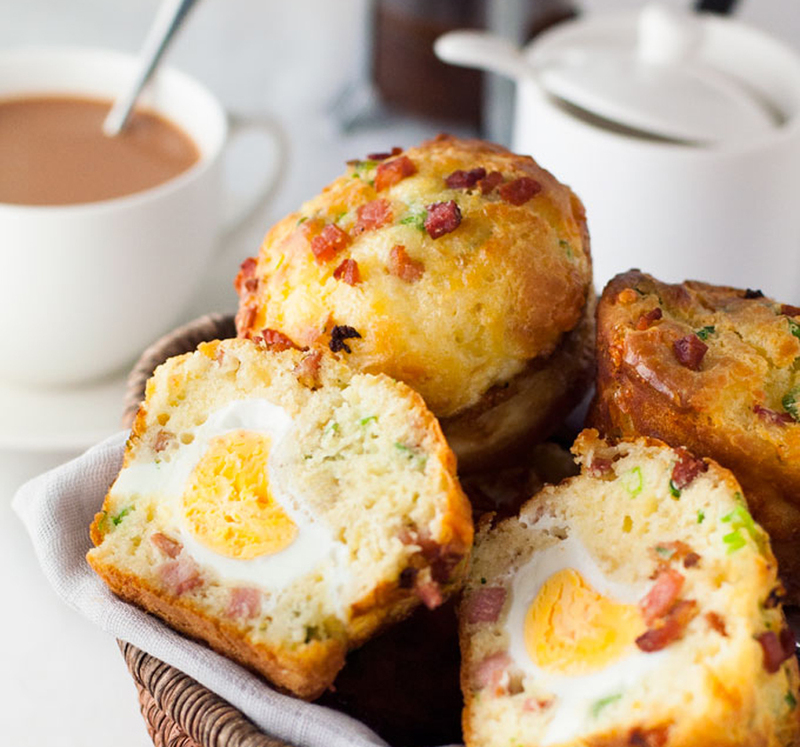 I love these Bacon and Egg Breakfast Muffins from Recipe Tin Eats because of the spin it puts on a traditional favorite: Mom will get a surprise when she breaks one open and finds a whole egg inside! Sure they’re a little more work, but Nagi gives specific instructions on how to assemble these impressive morsels. 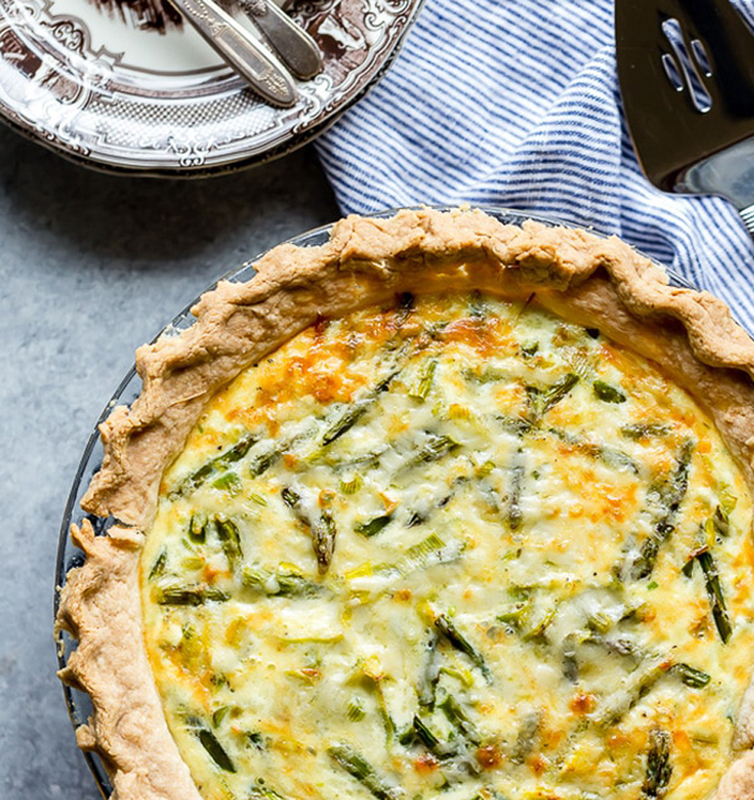 Quiche is back, and it’s the ultimate make-ahead holiday brunch dish. I love this Crab, Asparagus and Leek recipe from Fox and Briar that takes advantage of seasonal vegetables – and crab! – to elevate a basic quiche recipe. You can even give yourself a break by using refrigerated or frozen pie-crusts. Even the pros do it. 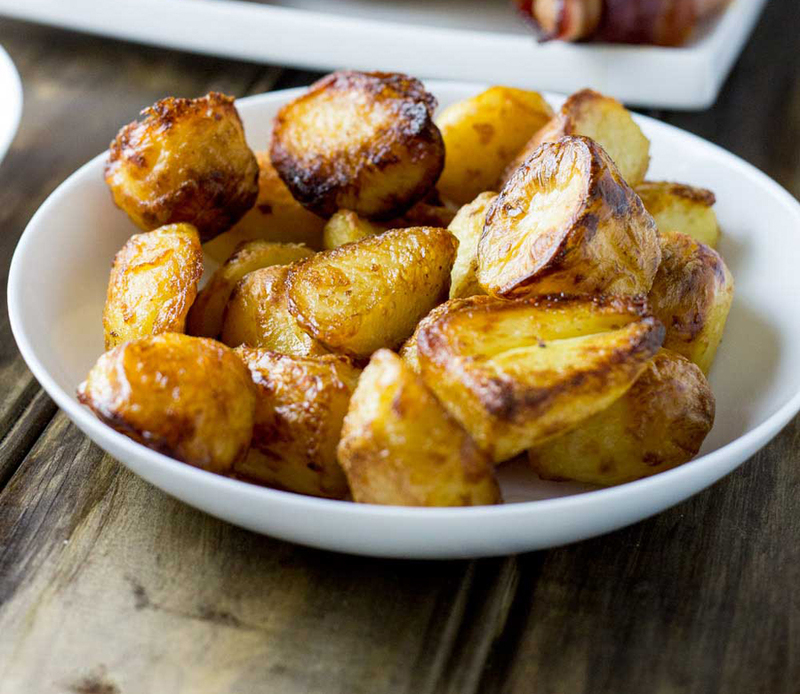 Brunch just isn’t brunch without potatoes of some kind (it’s a rule that’s written down somewhere) and these Prepare Ahead Roast Potatoes from Sprinkles and Sprouts will pair nicely as a side to any of the main Mother’s Day brunch dishes here. This is my family’s favorite go-to recipe, and they really are as crispy and fluffy as promised. The best part: they can be made up to a week ahead, which means you can get way ahead of the game if you’re planning a Mother’s Day brunch. Just make sure they don’t mysteriously disappear before May 13. Someone once said that brunch isn’t brunch without an egg casserole. Actually…I think it was me. Still, you can only put eggs and cheese into a Pyrex dish so many times. 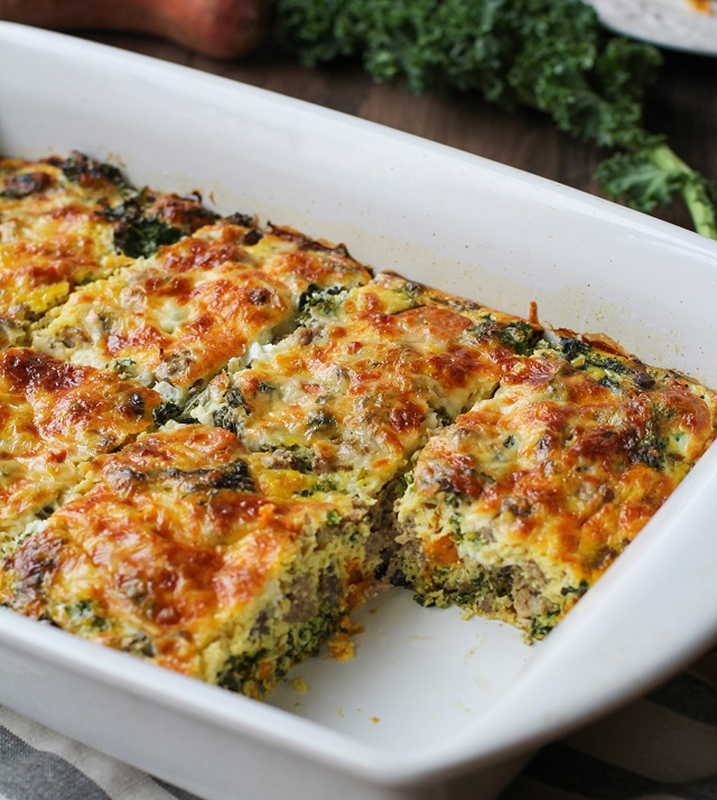 That’s why I was drawn to this Sweet Potato, Sausage and Kale Breakfast Casserole from The Roasted Root. This is a nighttime switch-up: sausage, kale and mushrooms provide just the right savory combo, and the sweet potatoes balance the flavors perfectly. (If Mom is a kale-hater, there are plenty of substitutions in the recipe that would still make an awesome casserole.) This will become your new go-to casserole for brunch — and hey, just in time to start planning that Father’s Day meal! 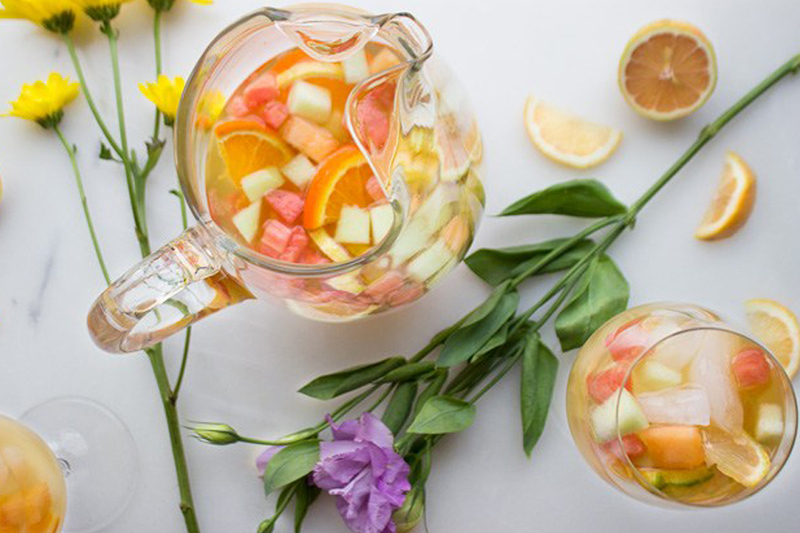 With all of this rich, delicious food for a Mother’s Day brunch, be sure to include something light and refreshing to healthy it up. 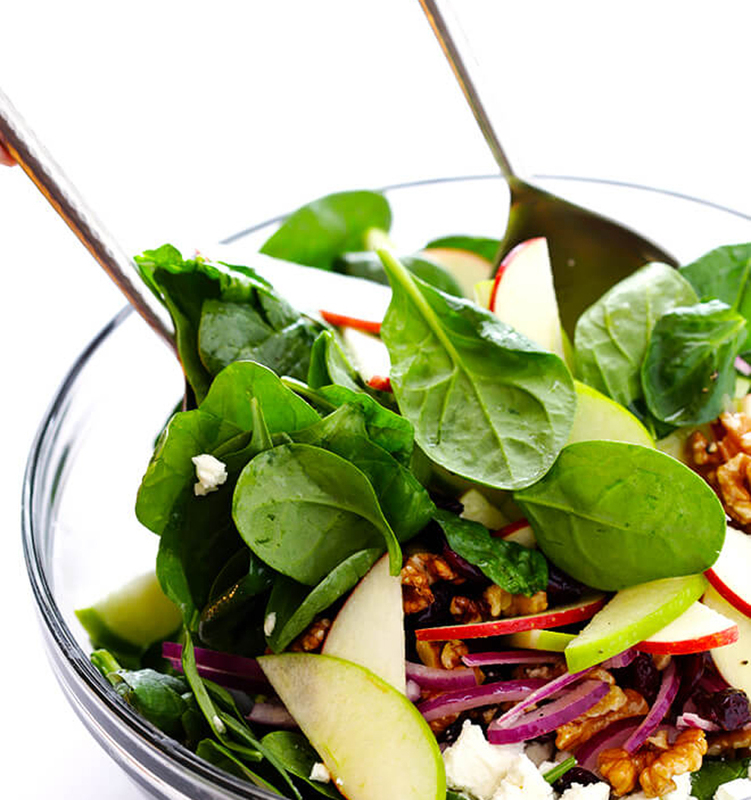 This Apple Spinach Salad from Gimme Some Oven would be a lovely accompaniment thanks to those tart, crisp apples, while also providing a gorgeous burst of color on the table. Make the champagne vinaigrette (her recipe is a great one to keep on hand) and gather all of the ingredients the night before and then assemble and toss together in the morning. Your mom will thank you for a recipe that she (or you!) can use all year long. 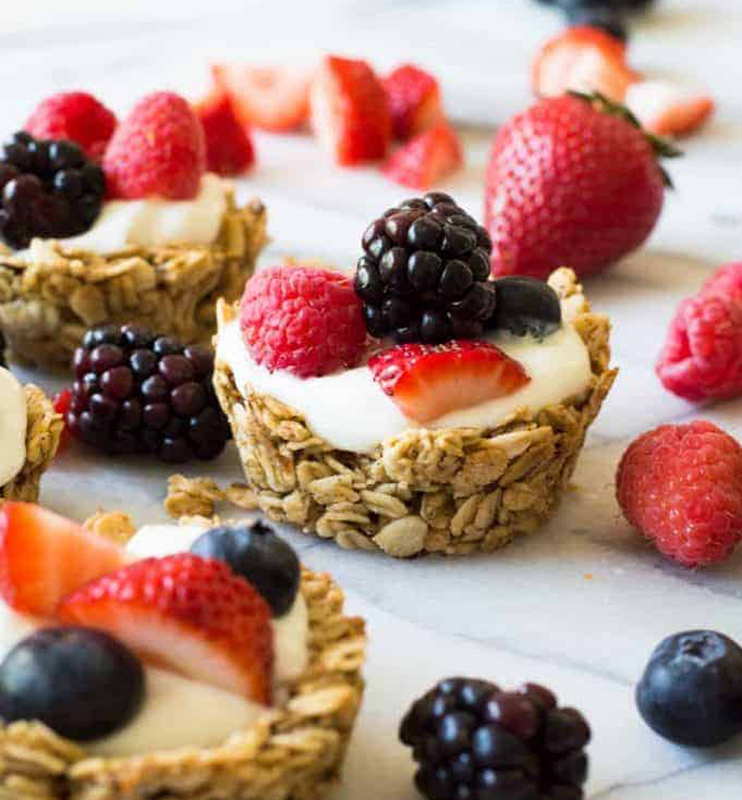 If you’ve got little ones who want to help (or uh, “help”) with Mom’s big day, these Fruit and Yogurt Granola Cups from House of Yumm are perfect for little hands to put together. There’s a great step-by-step video on the site that shows how small “cups” made out of oats, cinnamon and maple syrup are filled with Greek Yogurt and fresh fruit for a tasty – and healthy – addition to Mother’s Day brunch. Be warned – the kids might have a hard time saving these for Mom. Supervision required, if only to keep them from eating all their hard work along the way. If the mom in your life is never without her chai latte, then this is a perfect dessert for her. 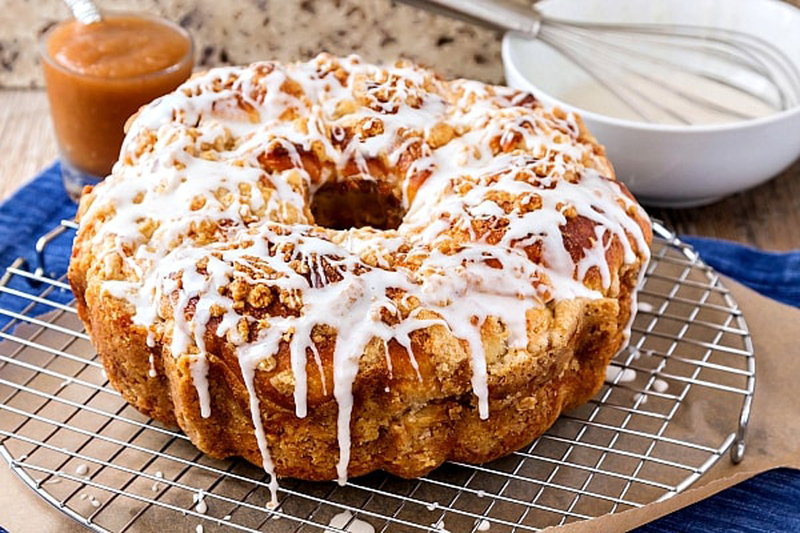 In fact, this Chai Spiced Apple Butter Coffee Cake from Jenni Field’s Pastry Chef Online is probably the perfect dessert for everyone because who wouldn’t want apples, chai spices and lemon baked into a luscious cake? Just know this is a super advanced dessert that takes some time, though the results should be well worth it; be sure to set aside the time after school Friday or a good chunk of Saturday to get this one done. When she smells this baking on Mother’s Day morning, you won’t be able to keep Mom out of the kitchen. 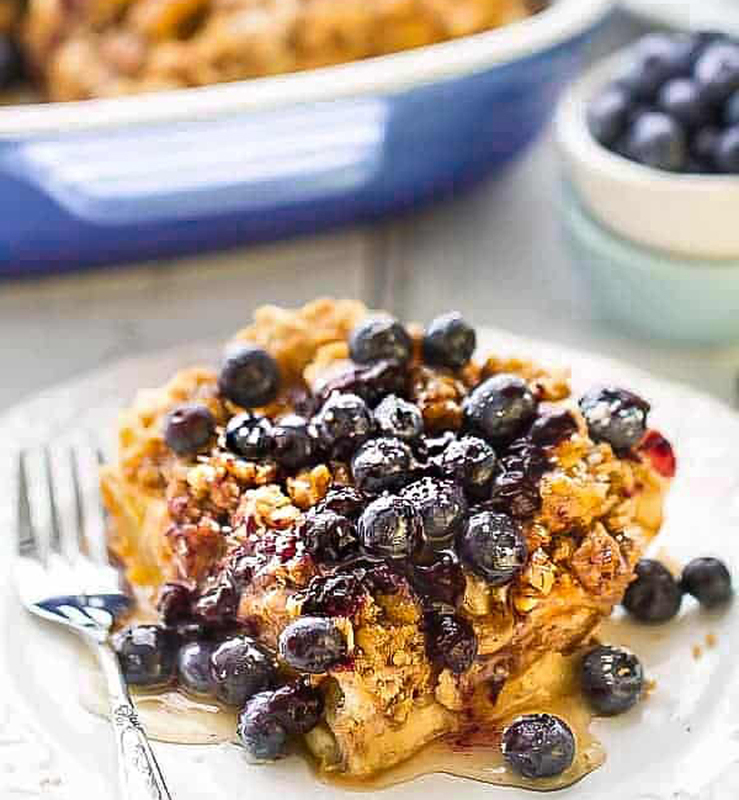 This delectable Blueberry French Toast Bake from Life Made Sweeter is made with a loaf of sourdough or French bread, cinnamon, brown sugar, maple syrup and topped with blueberries. It’s the perfect make-ahead dish – simply take out of the fridge and pop in the oven. You might just have trouble getting Mom to share. 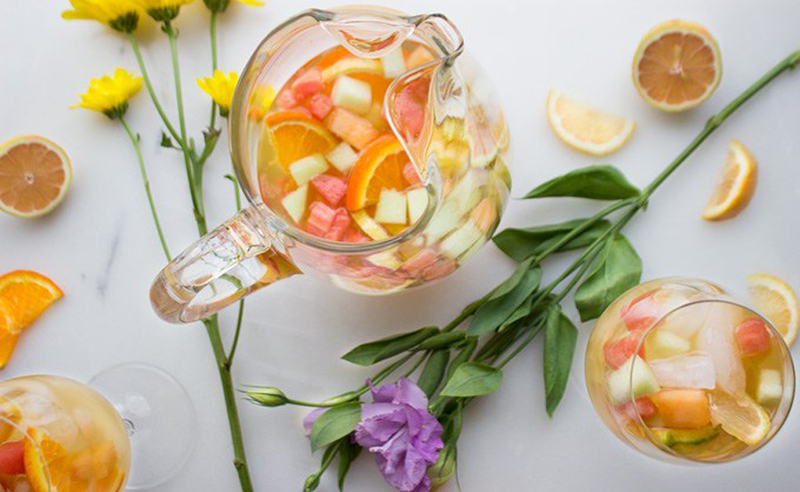 A special occasion requires a special toast, and I think this Sparkling Melon and Citrus Sangria from Our Food Fix would be something I’d love to imbibe on Mother’s Day. This festive cocktail is made with three different kinds of melons, lemon, orange liqueur, melon juice and Prosecco — so be sure to check the ingredient list and make sure you’ve got it all planned! Sangria always tastes best when it’s made ahead, so I suggest mixing the fruit, liqueur and juice the night before, then top off with the Prosecco right before serving. The best part for a family brunch like Mother’s Day: You can easily set aside a separate batch for the kids without the alcohol so everyone gets to toast mom. 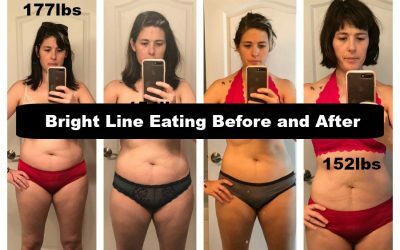 Marsha Takeda-Morrison is an LA-based designer and writer who covers pop culture, entertainment, life and parenting in Hollywood, and still finds time to cook -- and share the kinds of food photos that will make you hungry 24/7.